People frequently question the point of their life, particularly when stuck in a rut or when nothing much seems to be happening. As often with the language, there’s a truth behind the words which, when perceived, reveals the origin behind the structure of the form. 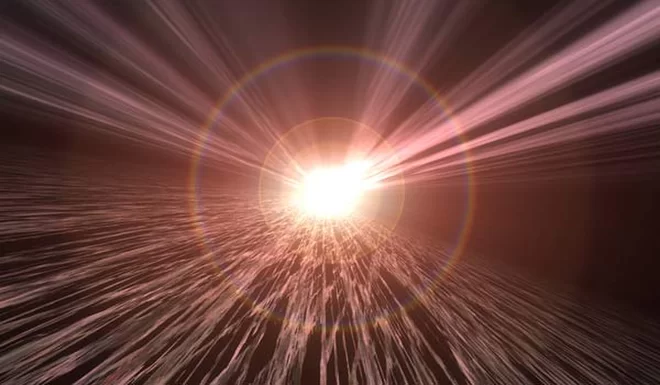 Emerging from infinity, the point manifests as everything in existence, expanding and contracting in a micro interval at a velocity beyond the speed of light. The recognition of this one and only causal event demonstrates the truth behind science’s big bang theory, except of course it is apprehended now and not as some cosmic event billions of years ago. This eternal moment is being replicated in descending gradients of time or levels of mind, including our own experience as each individual life on earth. The point of existence is retained in the centre of the brain as our light of self-knowledge. This self-knowledge is what we are, but each at a particular degree of illumination which determines our perception of reality. The point is always present, but its radiance and power can only be realised at its full potency of enlightenment to the degree that an individual has begun to detach from the momentum of the world. The luminosity of the point in most people’s perception is diffused and obscured by the movement of the mind as aimless thinking and worry generated by the emotions. This has the effect of corrupting the inner space in a similar way that sediment clouds the wine bottle when disturbed. The truth of existence is accessible to anyone. However, until the perception is refined and distilled, the mind will dismiss the formless inner space as an indication that there’s nothing beyond its own understanding. This apparent void is a necessary precaution to shield the perception until it’s able to hold the spiritual idea retained within the point. But through the practice of stillness in withstanding the isolation and absence of experience, the inner space is purified to gradually reveal the point as the pure essence of life before it takes form. It’s the connection with the point that provides the artist with the inspiration that distinguishes every great work with a timeless quality and the hallmark of originality. The same principle applies to all other modes of creative expression. The difficulty is that people become attached to their worldly pursuits and fail to address their whole living life. Science’s search for the origin of the objective universe is similarly polarised and avoids altogether the thorny issue of death. This results in the point being only partially activated and gives rise to the feeling that something fundamental is missing in the life. Everything that can be conceptualised and retained as memorable knowledge is in the past. Ultimately the truth of existence can only be perceived now as direct knowledge from our point of reality within the brain. As the past is transformed and brought up to the present through an individual’s purified space, the point begins to glow with a greater enlightenment. When it reaches a particular luminosity, the light becomes a self-sustaining presence of divine power. This is the point of life on earth: to bridge the gap between time and the timeless place whence we come – and mercifully return when all has been expressed in the world. This means a lot and your last sentence is enough hope for everyone. I spend a lot of time in suspension these days. Processing, setting memories free leaving space between.